This is a brief backgrounder about my self-imposed, unique project to heal myself naturally of an aggressive skin cancer labelled "Parotid Squamous Carcinoma" that was diagnosed on February 20, 2015. I had an abnormal growth appear on the right side on my face in the fall of 2014. I went to my family doctor on December 1, 2014 and he referred me to a plastic surgeon. I did not get an appointment until January 28, 2015. The plastic surgeon proposed a surgery for January 30, 2015. During the surgery, the nerve to my right eye was severed and now my right eye no longer winks and blinks and so I have to add “Refresh Tear Drops” on a regular basis. After the surgery attempt, the abnormal growth on the right side of my face grew to be much bigger - about 5 cm in diameter and about 1 to 1.5 cm. thick. They explained that “parotid squamous cell carcinoma” can be an aggressive cancer and where it is located is of concern. If they do another surgery, there is a high risk of damaging nerves on the right side of the face. Of course, the oncologist and radiologist recommend radiation. In summary, the doctors finished the appointments on March 26, 2015, saying that there were basically three options ahead (based on mainstream hospital therapies) after they examine the MRI and the cat-scan. 3. do nothing by their definition BUT I have been investigating and implementing various natural treatments and therapies for the past 4 months. I had an MRI on March 11, 2015 and I just had a follow up MRI on May 31, 2015. I got the results of the follow up MRI on Thursday, June 4, 2015 and it seems there is no evidence that the abnormality on the right side of my face has gotten any worse. I plan to keep on doing what I am doing and I have declined radiation and chemotherapy. I welcome your thoughts and prayers and I intend to heal myself from this diagnosis of “parotid squamous cell carcinoma” - hopefully with natural treatments/therapies - we’ll see what evolves.... Your donation will help with the expenses of the natural treatments and therapies as they are very costly. iI takes lots of work to heal oneself naturally from any cancer diagnosis. AND I will follow up by sharing the complete details of which natural treatments or therapies that are accelerating the healing process for myself. I am satisfied with the evolutionary healing process that the abnormality on the right side of my face is experiencing. On this past weekend, it seemed to go though a significant change. Last week, the radiologist was once again recommending radiation. I declined again. Now it seems ready to disintegrate and dissolve. On Friday, I had a 4 hour session with the “Quantum Healing Technology” and another session again today. On the weekend I kept the abnormality covered with a bandage soaked in a paste of sodium bicarbonate. It seemed to accelerate the healing process and I could feel a tingling or pulsing most of the time. This morning when I removed the bandage, it seemed to be deteriorating rapidly - there was a lot of blood and mucus on the bandage. Tomorrow I have a Skype consultation with Dr. Mark Sircus. AND I just ordered some Black Salve. Of course, these alternative treatments/therapies and none of the other treatments that I am following are covered by our “Sickness and Disease” system and they are all very costly. 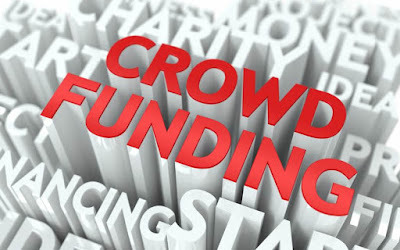 Today, one of my good cyberspace friends sent me the links to a Crowdfunding website - you’ll see below - and told me that this unique concept of “Crowdfunding” could be used to raise funds for my Natural Healing Journey. Together, myself and my team will promote your projects with our projects and everyone wins in a spirit of co-operation. Otherwise, should you decide NOT to launch your own Project, you can still donate to “My Project by clicking on the Paypal “Donate” Button. My Project - My Natural Healing Journey - An Update! NOTE: This article by Deborah MacDonald titled: "Why You Should Maintain Health and Wellness While Building Your Business" resonated with me when I read it - for my earnings have decreased and my expenses for "health and wellness" have increased because of this current 'health challenge." The bottom line is to (a) change our eating habits and (b) avoid stress - NOW and to avoid "sickness and disease" in the future.